Passengers were invited to take photos with and enjoy some of the cake given to Cabin Crew on the flight. 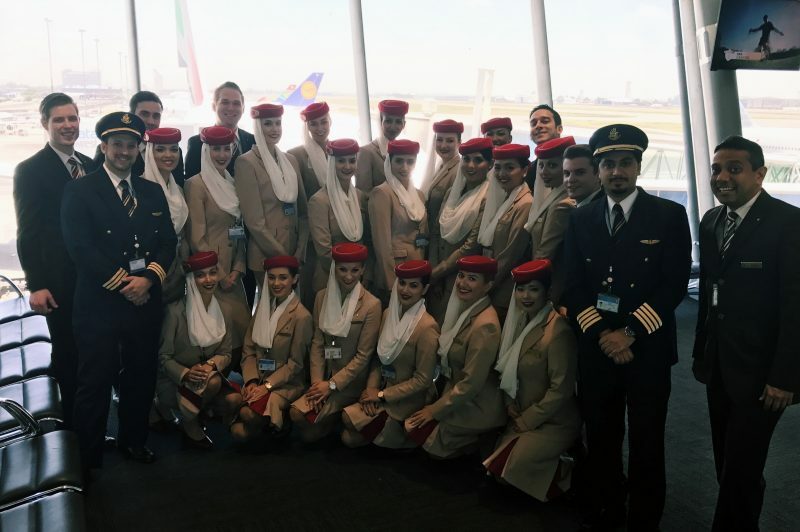 On February 1, 2017, I had the pleasure of operating the Emirates Airbus A380 Inaugural from Johannesburg, South Africa to Dubai, United Arab Emirates! An inaugural flight is defined as the first flight of an aircraft that is being introduced by a carrier to a route for the first time. On occasions such as this, Cabin Crew are nominated to operate the flight by management, then chosen to participate by a selection committee. It’s an honour to have been able to participate in this experience! To celebrate this momentous occasion, Dnata Newrest surprised us with a giant cake that we opted to share with our passengers. 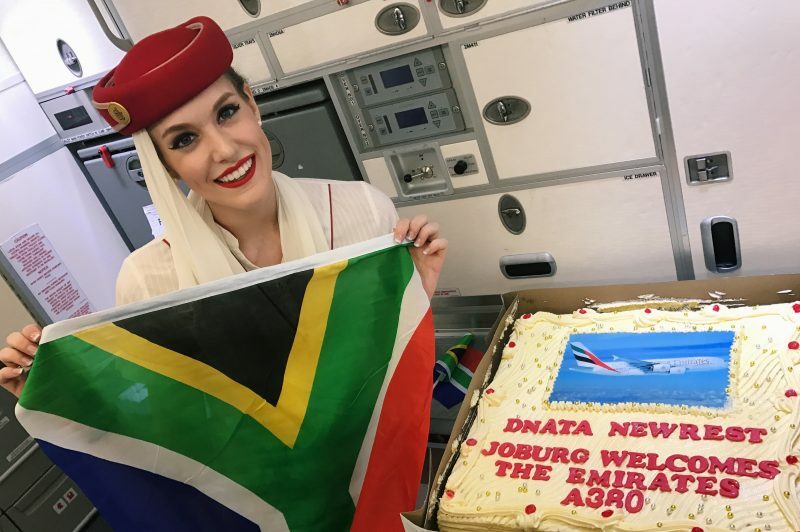 The disembarking Cabin Crew (that came into JNB on the Emirates Airbus A380-800) also left us several South African flags that our customers were able to take pictures with. The Emirates Airbus A380 offers a total of 516 seats in a three class cabin configuration, with 14 private suites in First Class, 76 mini pods with lie-flat seats in Business Class and 426 spacious seats in Economy Class. It is renowned for its on-board lounge on the upper deck for First Class and Business Class customers. First Class customers can also enjoys the added benefit of exclusive use of the on-board shower spas to freshen up during flights. There are currently four flights a day between Johannesburg, South Africa and Dubai, United Arab Emirates. This particular flight (EK761/762), is currently the only flight between the two destinations operating on the Emirates Airbus A380. The remaining three flights currently use the Boeing 777-300ER. Our amazing team prior to take off from Johannesburg, South Africa to Dubai, United Arab Emirates. How does the airline so many hawt women like you!??!??!?!? AHHHHHHHHHHHHHHHHHHHH!!!!!!!!! Oh, the men, make me cringe.